As Apple prepares to open its first retail store in Singapore, the company has also expanded Apple Maps feature availability in the city-state, enabling transit directions. 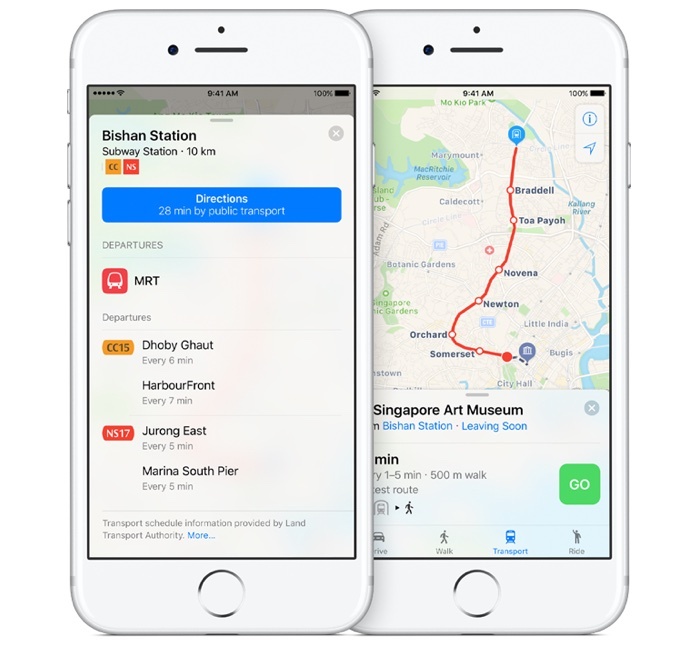 Transit information may still be in the process of rolling out to all customers, but according to the iOS section of Apple's Singaporean website, and a feature availability list, transit directions are live in Singapore. Apple Maps now allows users to get directions for the Mass Rapid Transit (MRT) system that spans across most of Singapore using the "Transport" tab within the app. Each MRT line is color-coded for simple navigation. Along with transit directions, Apple Maps in Singapore is also gaining points of interest, a feature designed to highlight notable buildings, parks, and other landmarks. Transit directions have been available since iOS 9 launched in 2015, and while availability was limited at launch, Apple has been slowly expanding transit information to various countries around the world. More than 10 countries now have access to transit directions, and the feature has also expanded to many locations in the United States. A full list of where Transit directions are available can be found on Apple's website. It's fairly easy to travel by MRT in Singapore, what about bus lines, are they also included? Edit: I just checked out the link provided above, just 41 City's (And 3 countries) around the world have transit provided by Apple Maps, that's just awful, expected a lot more. The Bolded ones is are odd ones, whole countries! Here we go again. Please get informed. These are regions, not cities! There are well over a thousand cities and hundreds of millions in population covered! I'll once again provide the link to explain why Apple doesn't just turn on all the cities at once, like Google did. Apple could do what Google was heavily criticized for and simply flip the switch and import all the data from everywhere at once, but that data is unreliable in many instances and doesn't measure up to the individual customization that Apple is doing for each REGION. Yes, it takes much longer and is much more labor intensive and expensive, but Apple learned its lesson with its terrible roll out and is now committed to building the ultimate mapping program, all without sacrificing your privacy as Google does. It also works for bus services, not just MRT. Public Transport for the whole world please!!!!!! Seriously, why not, with all the money Apple has. Actually, why is there not one common database/system so that everyone can have transit.